With June comes berries. First the strawberries trickle in, slowly followed by blueberries, raspberries, blackberries and cherries. By mid July we’re practically swimming in berries–certainly not a bad problem to have. But as quickly as they arrive, bursting from every stand at the greenmarket, they soon disappear, leaving us with regret. Wishing we had just one more piece of strawberry shortcake, another bite of that raspberry cobbler or another scoop of blackberry sorbet. We try to fool ourselves with California berries during the winter months, but it’s just not the same. 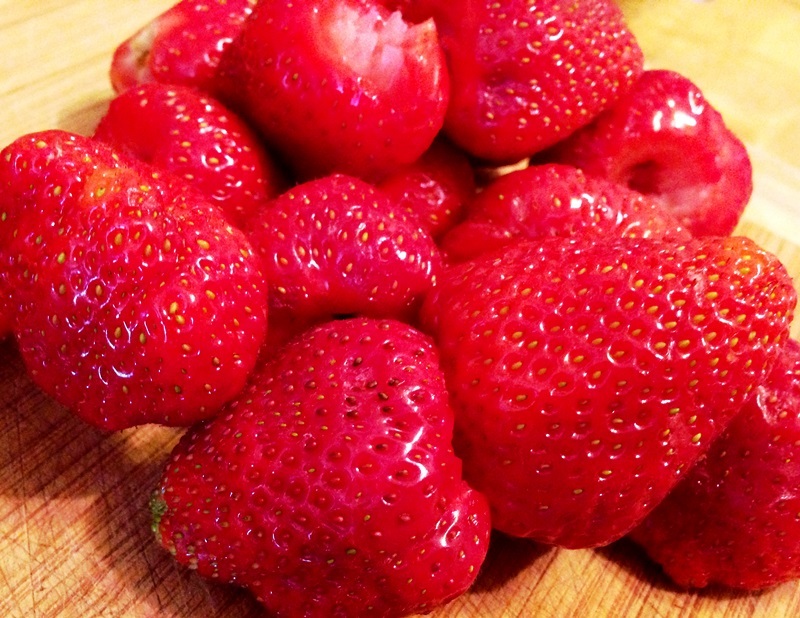 While we might not be able to get fresh local berries year round, we can preserve them. A jar of homemade strawberry jam is beyond perfection. You’ll never glance at those Welch’s jars again. Over the past few years I’ve mastered the ordinary jams–strawberry, wild blueberry, even sour cherry preserves. I was ready for something a bit more out of the ordinary. I came across a recipe for lavender strawberry jam. As delicious as the floral scented recipe sounded, it had actual lavender flowers in it. I love floral notes, however the thought of crunching on flowers while eating my fresh scones with jam is not an appealing idea. Instead I decided to take things into my own hands, with a lavender simple syrup and a ton of fresh berries. A dash of pectin helps thicken the recipe to perfect spreading consistency. In a small saucepan bring water and 1 cup sugar to a boil. Stir to make sure sugar is completely dissolved. Remove from heat, stir in lavender, cover and steep for 30 minutes. 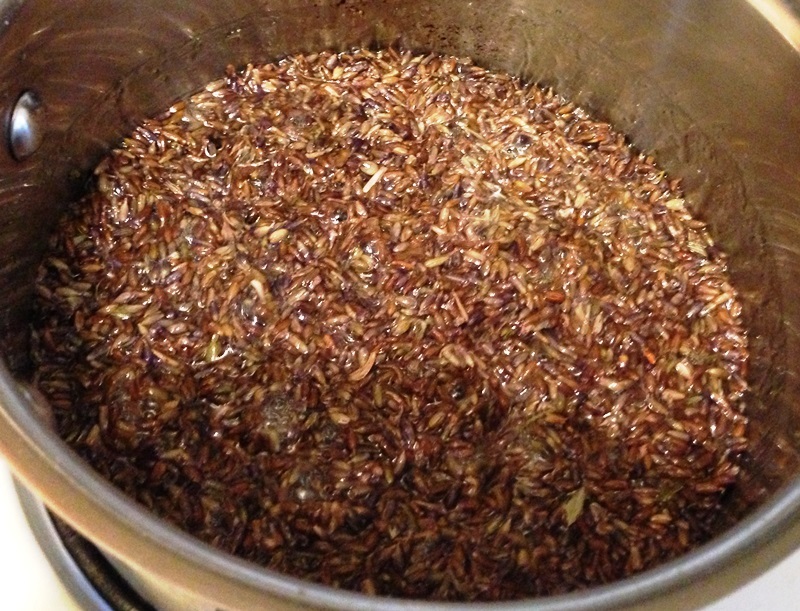 Strain syrup into a large saucepan or dutch oven. 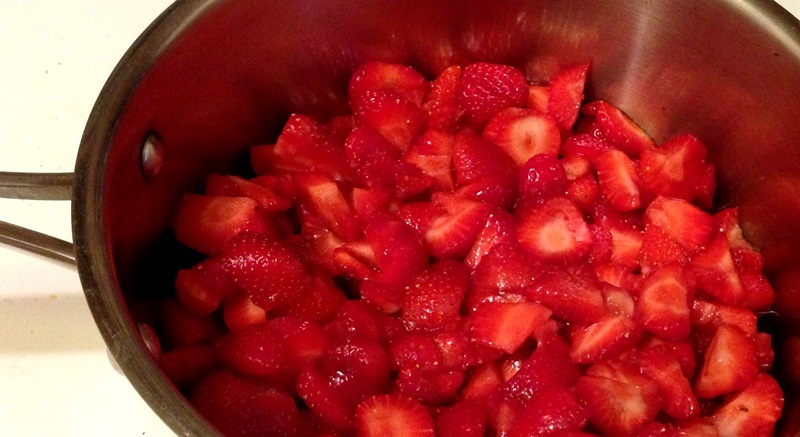 Add strawberries and scraped vanilla seeds and bring to a boil. Reduce heat and continue cooking until fruit completely breaks down, stirring frequently so not to burn, about 15 minutes. Be sure to skim any foam that appears. In a small bowl, whisk remaining tablespoon of sugar and pectin. Add to strawberry mixture, stirring vigorously until pectin dissolves. Increase heat and boil for an additional 5 minutes to let thicken. Remove from heat. 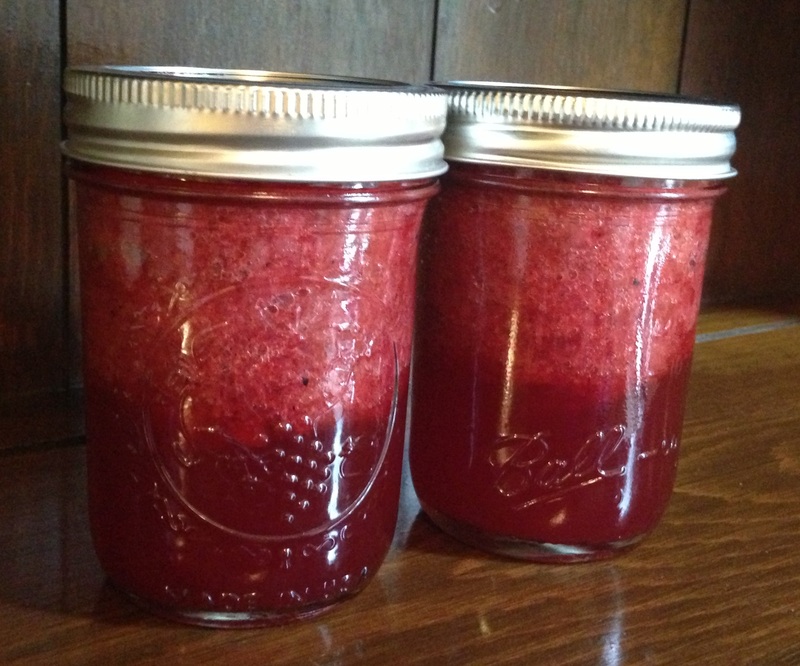 Ladle jam into hot, sterile half pint jars, leaving 1/4″ headspace. Process in boiling water bath for 15 minutes. Remove from water and let cool untouched for 24 hours. Label and store for up to 1 year. It really is. Enjoy the recipe! I love making jam, strawberry and lavender sound like a great match. Can’t wait to get started jamming. I know. I’m trying to edit myself this year. Just a few jars of each. Last year I made way too much. I forced jars of jam on everyone I know and still have some leftover. I can’t wait for cherries. That was the only think I made too little of. I did the same last year and still have a few jsrs left, I went nuts with concord grape jam, I love it! I have to try this strawberry lavender. Sounds like a great idea! We’re a couple weeks away from Strawberry Season still but I’d love to try this. What did you think of the end result? Loved it! Bursting with strawberry flavor with a hint of lavender. The vanilla bean also helped balance it out. My only gripe is that I used sugar for the sweetener. Usually I try to use honey or agave nectar, but not sure I could have achieve a simple syrup otherwise. Holy heavenly jam – this sounds so incredible! I’m a total sucker for any with lavender, it makes me feel like I’m living in my own little spa. Can’t wait to give this a shot, once I get over my irrational fear of the boiling water bath. Don’t fear–embrace the boiling water bath! If you can a lot your hands develop a resistance to heat. By August I can pretty much stick my hand right in the water w/o pain. Unfortunately, it wears off over the winter and I always wind up with a few burns when I start again in May. Trust me, a little pain is worth it for the delicious results! Melissa, this jam sounds amazing! This is my first visit to your blog and I’ve been enjoying your strawberry series. Unfortunately it’s winter here now, so strawberries are hard to come by, but I’m bookmarking this recipe for when they become seasonal again. Love your blog. Following from now on! I can’t wait to make this! You can make a good simple syrup with honey. The ratio is 1:1. I make one with ginger, let the ginger steep for an hour or so while it’s cooling, put it in a squeeze bottle and add it to a glass of club soda. Instant ginger ale! It’s really good. Let me know how it turns out! Love the ginger ale idea. Ginger is actually one of the few things I’m not a fan of (small doses only) but my husband loves it. Plus I just learned you can regrow ginger root in a pot in your kitchen. I can make some syrup, he’ll drink it up, and start all over again! Thanks! What kind of pectin do you use? Liquid? I use the powdered version.